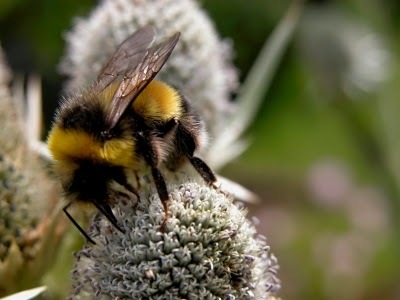 A bumble bee (Bombus terrestis) collecting nectar from a flower. Photo by Tom Curtis. Standing upright, a few meters above the ground, looking out into a colourful garden that you put so much sweat and muscle into.. it's far too easy for us humans to forget all of the other workers that contribute to our food system. In conventional agriculture the goal is to increase the yield of your crop. Typically this is done by altering the environmental conditions around your crop to help it grow better. This includes dousing the ground with herbicide so that no plant neighbours can possibly survive in the soil, spraying the field with broad-spectrum pesticides to kill off all of the bugs in your field, and giving your crop a dose of fungicides to annihilate half of the life growing within the soil. All of these changes are made so that the farmers one crop (let it be canola, lettuce, tomatoes, or bananas) receives no challenges in it's time until harvest. 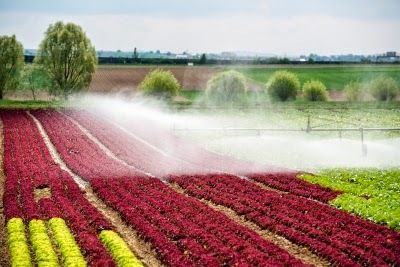 An irrigation system waters a field of lettuce in early spring. Photo by franky242. If you're thinking that that sounds like a lot of effort, money, and use of chemicals you're absolutely right. In order for an ecosystem, found in nature, to survive, no input of chemical or work or money is needed. What allows the ecosystem to stay healthy are the natural dynamics of it's inhabitants with their environment. Plants and bugs, for example, have been co-evolving for millions of years. Throughout this time they've had a chance to create some really fascinating mutualisms. A mutualistic relationship is a type of symbiosis (an interaction between different species) where the relationship benefits both parties. One of the most famous mutualisms on the planet is the relationship between a plant and a pollinator. A pollinator visits flowers to collect nectar to eat. During the visit the pollinator picks up pollen and then proceeds to visit other flowers, thereby helping to fertilize the plant populations. A spider catches an insect in its web. Photo by arkorn. There exists hundreds of examples of these beneficial interactions between plants and other species. Spiders create webs which allow them to trap and kill smaller insects which oftentimes prey on plants. A ladybug is a predator of little green garden bugs called aphids. By eating these aphids and keeping their population under control, the aphids don't do serious harm to the garden plants. Many wasps kill harmful caterpillars (harmful because they may devastate certain crops) by injecting their eggs into them so that their larvae can develop by feeding on the insides of the caterpillar, eventually killing them. So some of these examples aren't quite as romantic as a pollinator and it's mutualism with a plant. But they are all incredibly powerful relationships that we, as food producers, can encourage in our food systems. A wasp looking out from it's hole and enjoying the view. Photo by SweetCrisis. Predatory insects like ground beetles, spiders, and lacewings will benefit greatly by a cover crop (such as clover) or mulch (grass clippings, dead leaves) in your garden instead of bare soil. Low growing plants such as thyme, rosemary, or mint also provide shelter for these insects while they're hunting and cover to lay their eggs. The flowers on these plants will benefit pollinators as well. Flowers with a lot of tiny blooms (yarrow, carrot, dill) will benefit parasitic wasps and composite flowers (sunflowers, asters, zinnias) will attract predatory flies. 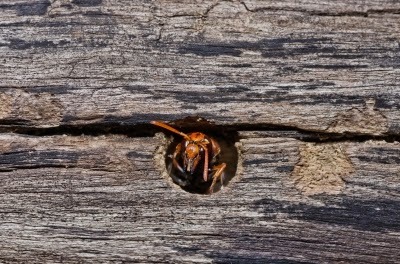 If you want to provide a home for wasps and solitary bees you can drill different sizes of holes in a log and put it in the shade. These logs will provide them with a place to lay their eggs and save them the trouble of digging out the holes themselves (they will instead spend that time pollinating the garden and preying on the leaf-eating bugs!). 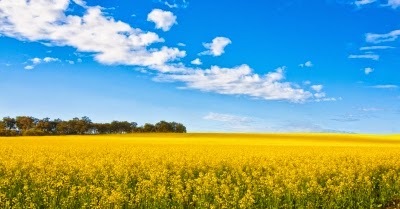 A field of canola. Photo by John Kasawa. One of the most important things that we can do as gardeners is to plant a variety of crops instead of large areas of one crop. This creates successive blooms for pollinators providing them with food over an entire season instead of for only a month or two. Imagine you were a bee living next to this canola field with a different canola field on the other side of you. In the spring before the canola flowers bloom you would have to travel several kilometers to reach a food source. Once the canola was finished blooming, you would again have to locate an alternate food source. It would be much easier (and afford larger pollinator populations) if the landscape was a myriad of different crops blooming at different times, providing food sources to different species, providing homes for different insects and animals - and ultimately more closely mimicking a natural system. If we can provide these behind-the-scenes garden workers with what they need to stay healthy, we can easily create these natural interactions and relationships within our own food systems. By understanding and providing for them what they need, they'll complete a lot of the 'work' that happens in a garden making our role easier and leading to another harmonious mutualism in nature - between the food producer and the residents of the food system. Your post is extremely informational, and gives a very in-depth view of the symbiotic relationship. I believe if someone is interested in this topic, they should refer to this.